Years ago, I used to give up chocolate for Lent. This year, Ash Wednesday fell on the same day as Valentine’s Day. I ask you: is it reasonable to not eat chocolate on Valentine’s Day? I am glad I reconsidered my approach to Lent a long time ago. The idea behind Lent is to engage in some form of sacrifice to enrich our souls and deepen our faith. It is a time for us to spiritually prepare ourselves to better celebrate Easter. Lent reminds us of Jesus’ forty days of hardship and temptation in the desert when he strengthened himself for His mission. Growing up as a Catholic, I tended to observe Lent in two ways. I gave up some pleasurable activity (like eating chocolate) for forty days and I did not eat meat on Fridays between Ash Wednesday and Easter Sunday. I’m not sure that either ritual had much of a positive impact on my spiritual development or my ability to joyfully commemorate the Resurrection of Jesus on Easter. First of all, avoiding meat on Fridays is not that tough to do. Let’s see…. I can’t eat meat, but I can eat lobster, shrimp, grilled cheese sandwiches, vegetarian pizza, and peanut butter. That doesn’t seem all that sacrificial to me, unless I have to eat all those things at one sitting. That might be pretty penitential, but I don’t think anyone advocates stuffing the body with a feast of nonmeat products as a means of spiritual enrichment. As far as giving up something goes, I do think there is some intrinsic value in sacrificing something we enjoy as a spiritual exercise to remind ourselves of Jesus’ sacrifice for us. It reminds us to be grateful for what we have and to remember that the greatest gift is salvation. I do tend to feel, though, that a sacrifice is more meaningful if it also generates a positive impact. I don’t think giving up chocolate had any impact on me at all except possibly to make me a teensy bit cranky. Maybe my sacrifice would have been more meaningful if I had saved the money I didn’t spend on chocolate ice cream and donated it to a food bank or something. Instead, I am ashamed to admit that I just spent the money on vanilla instead. I never thought about the second piece of the Lenten observance equation. I understood the “I’m going to give up” part but never addressed the “so I can do X” part. A friend of mine is doing something this Lent that I think perfectly illustrates the point. She decided to give up television for Lent. It wasn’t that she gave up TV simply to make herself suffer. In fact, she says she is actually enjoying the break from television. In deciding on her Lenten observance, she didn’t focus on what she was losing. She focused on what she was gaining. She gave up television to give herself the time to read and study and pray. She believes that, in this period of focus and reflection, God is teaching her all kinds of valuable lessons. I have not always been great at following through on Lenten observances that require me to do something overt rather than simply stop doing something. Some years, I tell myself that I am going to read a spiritual book or go to additional worship services or step out of my own internal world and mend relationships with others. Then, suddenly, Holy Week is upon me and I have done nothing out of the ordinary. Some years, though, I have found rich and beautiful observances that I still remember with gratitude. Last year, I began reading the entirety of the New Testament in order. One year, I subscribed to a program of daily Lenten emails and worked on implementing their challenges in my everyday life. A few years back, I wrote a letter to a different person every day during Lent to thank him or her for the richness he or she brought to my life. All of these Lenten “penitential” activities brought me more joy than I can describe. This year, I didn’t give up anything. I continue to walk my way through the Bible. Last Advent, I started in on the chapters of the Old Testament and I expect I will be at that for some time to come. I am also working through a book about developing a deeper relationship with Jesus and journaling about how I see the author’s message impacting my life experience. I also gave a presentation at a church women’s’ group. I struggle with wanting to contribute whatever talents I have to support the church and nurture the people of God, yet I am not confident that I have the talents necessary. I am an extremely introverted, shy person. The idea of giving a presentation of any kind is daunting. When I was working, I did a lot of teaching and presentations. I was a popular speaker. People were kind to me. I enjoyed the activity, even though I was always very nervous beforehand. Soon after I finished a successful presentation, I was always consumed with the certainty that the success was a “one off” event that I would never be able to replicate in the future. In addition to my general insecurity about speaking to a group, I have only been to a few of these women’s group presentations in the past. I was not completely certain of what my audience would want or expect from me. As the day of the presentation got closer, I felt the anxiety level in my gut increase. All the preparation I had done felt inadequate and I felt confused about how to proceed. I had several, ill-formed ideas for the general approach I could take to present the information I had gathered. In speaking to a friend, she suggested that I ask God how to proceed. We agreed that I should try to relax and let the Holy Spirit take over my anxiety about the presentation. I followed her advice and, of course, everything went fine. I said that I didn’t give up anything for Lent this year. I guess I actually did. I gave up anxiety about the presentation. I gave up the feeling of stagnant comfort when I agreed to be the speaker for the women’s program rather than simply a member of the audience. I gave up a small amount of time and frenetic energy to focus on reflection each evening. My experience this Lent has not been a journey through a desolate desert. Instead, Jesus has taken me on the scenic route to Easter and I am enjoying a beautiful view! What do you think? Do you give up anything for Lent or do anything special? Please share your perspective by leaving a comment. In the alternative, you can email me at terriretirement@gmail.com. SPECIAL ANNOUNCEMENT COMING NEXT WEEK!!!! PLEASE TUNE IN NEXT WEDNESDAY FOR SOME BIG NEWS!!! If Life Is A Highway, Did I Take The Wrong Offramp Somewhere? Do you ever look around you and wonder at how different your life is than what you thought it would be when you were younger? It happens to me all the time. For about the first thirty-five years of my life, the image I had in my head of what my life would look like at age 58 was nothing like what that life has turned out to be. When I was in high school, I took a career aptitude test. The idea was that it would be helpful to us students to learn what professions would take advantage of our natural talents and inclinations before we went off to college to spend four years of our lives (and four years of our parents’ money) preparing for a career for which we were not at all suited. My aptitude test indicated that I should be a priest or marry one. Remember, this was in the seventies and the idea that a woman’s “career” should be to support and advance her husband’s career was still pretty prevalent. At any rate, since I was a Roman Catholic at the time, it didn’t seem that either option was going to work for me. Maybe if I had come to the Episcopal Church sooner, I would have joined the ranks of the clergy by now. Since my career in the Church was doomed by convention and canon law, I considered other avenues. I kept coming back to the idea that I wanted to be a children’s librarian. I have always loved books. I spent many of my teenage hours volunteering at the local library. Some of those hours involved helping with story hours and summer reading programs for children. In fact, for the bicentennial year, I wrote and starred in a melodrama for our children’s program called Just A Minute, Man. It was so well-received, the county library officials asked us to do an encore performance. They even videotaped it for posterity. I am sure that old videotape is still packed away in some dusty box in the central library headquarters, if it hasn’t burst into flames some time in the last forty plus years. When I majored in English at college, I took a number of courses in children’s and adolescent literature. However, being a librarian requires an advanced degree. When I graduated from college with my Bachelor’s degree, I married almost immediately. My brand-new husband was a graduate student who required brand-new food every brand-new day. I had to get a brand-new job right away, so I pretty much took the first position offered to me. I also expected that I would stay happily married to the same man throughout my life. None of that really worked out. Not the happily part. Not the married part. Not the throughout my life part. When my husband left me after a little less than seven years of marriage, it was probably the best thing he ever did for me. It certainly didn’t feel like it at the time, however. My dreams of what “family” would look like in my life exploded. I got over the divorce years ago, but I’m not sure I ever really got over the beating my vision of my “family” identity took. On the other hand, I think the experience of my marriage and divorce were fertilizer for my growth into a real, three-dimensional, actualized person. It made me stronger, smarter, more compassionate, and more sensitive. It helped me think about things in bigger, more complex canvasses. Max and I often talk about what would have happened if we had met each other earlier in our lives. The bottom line of all those conversations is that neither one of us were ready for the other until the time we met. I couldn’t be ready for the happiness he and I have shared without the heartbreak of my earlier relationships, including my marriage. Part of the cracks in my perception of “family” was not just the dissolution of the marriage, but also the related issue of not having any children. When I was young, I always imagined myself as a mother. When I got divorced, making that vision a reality seemed much more challenging. Of course, I realize that getting divorced does not automatically shut down the dream of having children. One can remarry and have children. One can adopt children. One can try alternative processes like surrogate parenting or using a donor for the paternal half of the DNA. I just never made it happen. It isn’t that I ever really decided not to have children. Circumstances just never seemed right. A husband and future father of my children never materialized. I lived in Southern California in a tiny one-bedroom condominium, which I am guessing would not have been well-received by adoption agencies. I worked full time and made decent money, but would have struggled with paying for child care. Also, I always felt that, in a world where we could always have our druthers, a child should have a mom and a dad. Single parents can do an awesome job… some better than some dual parent families. However, to me, the best-case scenario, is to have two awesome parents sharing the burdens and joy of child-rearing. I guess in a way, I did decide to not have children by never arranging my life to have children. Still, if you had told the twenty-two-year-old me that I would not have children, I would have been dumbfounded…. And horrified. Years later, part of me still feels regrets that the “mother” part of my vision of my future never happened. However, contrary to popular belief, I don’t really think most people can have it all. I am not sure I have it in me to be the mother I would want to be in the circumstances that I ended up facing. I could have been a parent. Without the support of a fully-contributing partner, however, I’m not sure I could do it well. It would have killed me to not do it well. And there is another side to the coin. Without having children, Max and I can be our own children. We can be selfish with our time, energy, and money. I was able to retire at a fairly young age instead of working to pay college tuition. I have been able to enjoy life in ways that I could not have done if I was supporting children. I can support children’s charities with money that I would have spent raising my own kids. Yes, my life is very different than what I imagined. On the other hand, it is a pretty good life. I’m not complaining. What do you think is most surprising about the way your life has turned out? Please share your perspective by leaving a comment. In the alternative, you can email me at terriretirement@gmail.com. May all your surprises be good ones! Author TerriPosted on February 14, 2018 February 14, 2018 Tags career choices, childlessness, life plans, retirement lifestyle blog10 Comments on If Life Is A Highway, Did I Take The Wrong Offramp Somewhere? When I was living in California, I used to go to a small café called Bagels & Brew a couple of times a week. It is still there. In fact, the owners have opened a couple of more stores in recent years. They have delectable bagels, made fresh daily. They have nearly every variety of bagel you can possibly imagine. They toast and warm and slather bagels just the way you crave them. They also have wonderful egg dishes, sandwiches, and salads. I understand from people who actually drink coffee-related beverages that they make a mean latte. All in all, the food is great. It is so great that I would eat there even if the environment was less than appetizing. I would sit on a broken chair, wipe crumbs off a dirty table, and endure surly service just short of getting slapped in the face to enjoy a crispy, savory double-toasted poppy bagel with butter. The thing is I don’t have to endure any such shortcomings. If there is anything more satisfying than the bagels at Bagels & Brew, it is the atmosphere. The place is warm and welcoming and cozy. There is a busy-ness and a bustle that feels cheerful, but never manic or rushed. There are booths and tables inside, as well as outdoor seating. People from all walks of life, ages, and interests seem to congregate with a nosh and a drink. I’ve overheard business meetings, Bible study discussions, dates, and crucial conversations while chomping my bagel. The folks who work there are cheerful and seem to be genuinely enjoying their jobs. In fact, the employees make Bagels & Brew the “Cheers” of baked goods. Not only does everybody know your name and they’re always glad you came, but they remember what you like to eat and punch it into the register as you enter the store. When I was living in California, I could count on someone saying, “Good morning, Terri! The usual?” In fact, even when I made my first trip back to California after moving, the employee at the counter greeted me by name and remembered my poppy bagel double-toasted with butter… despite the fact that it had been over a YEAR since I had last darkened their doorstep. There is something very comforting about starting your day with a cheerful greeting from someone who cares enough to remember who you are and what you order. Starting your day with a few tasty grams of carbohydrates doesn’t hurt, either! On my most recent trip to California, I confess that no one in Bagels & Brew greeted me by name. Of course, I’d lost some weight and completely changed my hairstyle, so I wasn’t really playing fair. The bagels were still delicious. The environment was still cozy. The employees were still friendly. In fact, everything was just as I remembered it. As I entered the café on Wednesday, I noticed a sign announcing the availability of unicorn bagels on Thursdays, Fridays, Saturdays, and Sundays. UNICORN BAGELS!!??!!! What?!! Wow. Just wow. I was all over it. I knew there was no way I was leaving California without experiencing a unicorn bagel. I returned the next day, propelled by curiosity and craving for a fantastical, mythical breakfast. The unicorn bagel was AWESOME. 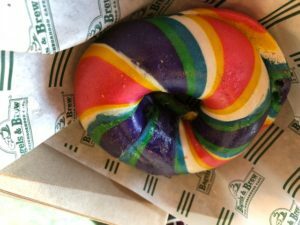 If a bagel and a rainbow-hued tornado had a baby, the result would be a unicorn bagel. To the more prosaic, the unicorn bagel is essentially a plain bagel wrapped in twisting, vibrant strips of food-colored dough. The result is a swirling, rolling rainbow of blues and pinks and yellows and greens. I, not being the prosaic type, was enchanted. I was so enchanted, I wanted to buy a unicorn bagel t-shirt. Unfortunately, the store did not have my size in stock. The manager offered to go home and print me one so I could pick it up later in the day or the next morning. Who does that? People who like you, I guess. I was back the next morning to claim my freshly-printed purple unicorn bagel shirt. It took me three trips (not that I’m objecting to three mornings of fresh bagels!) to Bagels & Brew, but I can now say I’ve eaten a unicorn bagel and have the t-shirt to prove it. I am the first to admit that there are parts of my personality that are just weird and neurotic. I regularly spend a certain amount of effort trying to contain those parts of my personality to keep me from going down in a fiery crash of insanity. There is another part of my personality, though, that is also weird, but I like to think is rather is charming. It is the part of me that stalks Tinkerbell. It is the part of me that hangs stockings at Christmas (including one for myself), fills them, and then asserts vehemently that the contents come from Santa Claus. It is the part of me that is tickled pink by feeding lemurs and giraffes. I hope I never outgrow whimsy! What is your favorite place where everybody knows your name and they’re always glad you came? Please share your perspective by leaving a comment. In the alternative, you can email me at terriretirement@gmail.com. If anyone is interested in learning more about Bagels & Brew, you can check them out at www.bagelsandbrew.com.